Separaciones, transitions, would-be divorcios, breakups. Mientras me preparo para lo que será my third big move, con enormes implicaciones, in less than three months comienzo a darme cuenta just how much of the last three years of my life han sido all about breakups. Hace tres años I broke up with the idea of never residing en ningún otro lugar excepto mi ciudad; the tagline for this very blog “i stay here porque el pasaje for everywhere else es demasiado caro” speaks of the high price I once placed on ever leaving my city. Un año despues comenzó a two year break up with a ten-year marriage, con la persona con quien me convertí en lo que today I am; hace un poco mas de dos meses, it was consummated. I spent el mes entero de abril breaking up with Tucson, la ciudad que alguna vez me conveció I could indeed find a place, somewhere else. Tonight, I broke up con el barrio, las calles where on a nightly basis me and my dogs made our presence felt; ellos cagandolas, ladrandoles y atrayaendo miradas; yo recogiendo sus cacas y saludando a extraños trying to rub off on them (and off them) if even a tiny part de la calidez que siento por estos pedazos de ladrillo, bloque, adobe y concreto; mishapen sure pero a la medida exacta de cada una de las manos y pies que les dieron forma in the first place. La he amado since before living in it, cuando solo manejaba cada dia a traves de ella to and from San Agustin, the place I left ten years ago; yet another breakup; otro desencuentro que diez años despues has become a return to true form. Ten years later, vuelvo a mi hogar. Mi país es un mashup of lack. c lo cmioo el d´a k ayr mesKpiiioooooo. (1) Two spectres haunt Cd. Juárez; its landscape–the spectres of Security and Eternity. Translation and photo by the author. (3) The first time I encountered the billboard, I was driving and hardly had a chance to glance at it so careful examination was out of the question, much less any notice of the immediate environment surrounding it; although I am fairly familiar with the area, the minute details escaped me as I had not driven through it in at least a year and a half. From that first encounter, only the general message, the gun and tie stood out. (4) The next day, after having lunch with a couple of long-time friends I drove back to the general area where the billboard is located; my friends came with me. On our way there I asked them if they had seen it, one of them said yes but could not remember exactly where it was placed; since I also wasn’t sure, and since we were driving opposite to the direction I had originally encountered it, we were all overly attentive to every billboard as it passed by. Eventually another billboard (Fig. II), one that I had already seen several times all around the city, came up in the horizon; it asks a simple, straightforward question: Eternity, where will you spend it? -It might be on the back of the eternity one, said my one friend who reported seeing the armed security billboard before. -It would be awesome if it is, I quickly replied. -You’re going to milk this aren’t you? said my second friend. And you, where will you spend eternity? (5) Both billboards share the same structure. They stand back to back facing opposite directions right in the corner of one of Cd Juárez’ busiest intersections; they safeguard each other from the constant traffic, the onslaught in the most dangerous city in the world. One side promises eternal salvation; the other promises complete protection. Drivers are made conscious on the need for maximum security as they head to work; on their way back home they are promised and assured that even in the face of tragedy salvation is but a matter of choice. (6) The security side (Fig. I) is visually arresting and somewhat sophisticated. A well-dressed man stands in front of a luxury black car with a machine gun resting diagonally across his chest, with a finger firmly resting on the trigger. He features no head as his body goes on beyond the billboard’s top edge; one, the viewer, understands the man to be whole yet a bit too large to fit in all within frame. The main text is concise and aligns perfectly with the visual image–both formally and semantically–in order to get its message clearly across: protection is within your reach. 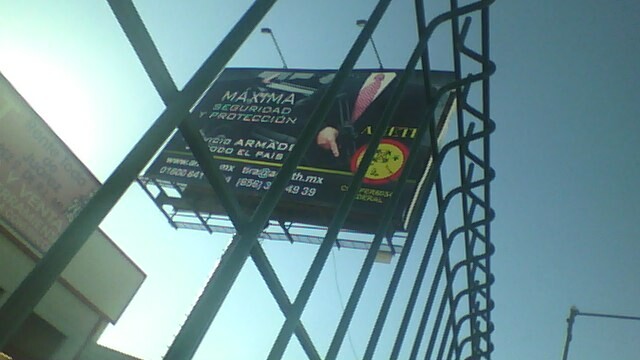 The secondary text speaks of the service being available all across the country, presumably the country México; since Juárez straddles the MX-US border this means that protection begins (or ends) right where the billboard stands. Lastly, two phone numbers, a web and email address along with a red and yellow logo round up the billboard. Not surprisingly, both the billboard and the viewing experience are dominated by the headless, armed man; the subject is made even more significant by the fact that many of the thousands of victims related to the drug/wars/on-drugs were in fact decapitated and found in public sites, sometimes even busy intersections like the one where the billboard stands. (7) The eternity side is far less refined. Horizontally and literally divided by ETERNIDAD between heaven and hell. The top half features several groups of individuals dressed in white, surrounded by clouds and engaging in celebratory stances as they enjoy the riches and spoils of everlasting peace while a luxurious golden palace awaits in the background. The bottom half is dominated by deep blacks and reds as isolated and fragmented people exhibit zombie-like characteristics as they obviously endure unimaginable amounts of pain and suffering. In the lowest portion of the canvas a question forces viewers to decide where they would rather spend eternity, while an internet address and a phone number is given so they can perhaps make an informed decision. The overall look of the billboard is quite kitschy and amateurish to the point of being laughable and suitable for a plethora of sarcastic interpretations. It is obvious, didactic and its layout responds to the most basic and dualistic understanding of how good and evil; salvation and damnation; happiness and suffering are situated with respect to each other. (8) Of course, both outdoor advertisements have been altered significantly. Through the process of documentation they have ceased to be billboards and have taken on the form of spectres haunting Cd. Juárez; its landscape. The spectres present themselves as texts to be read within the horizon of the city offering an intuitive understanding of what it means to experience life in an environment that has become paradigmatic of aggression, fear and danger. (9) The spectre of security was deliberately shot through a series of metal bars evocative of a prison cell where the viewer might be metaphorically held by the very need for the service advertised; the rods also serve the purpose of further segmenting a billboard that is already centered around a fragmented body, all the while serving as framing devices for particular elements like the tie and machine gun. 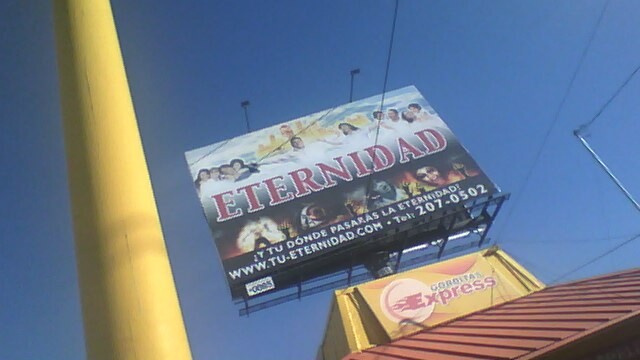 On the other hand, the eternity spectre is shot against a wide open, blue sky; framed by a single, yellow, metal staff that travels vertically straight out of the picture, echoing the promise of plenitude among the clouds; additionally, the word Express is legible below the billboard commenting even further on the absurdity of offering eternity at 55 kms per hour. Seen side by side (Fig. III), with their contrasting framing and reflexive devices, both spectres can relate to each other in new meaningful and thoughtful ways. Stephanie Springgay: The body in pieces intimates completeness while simultaneously deconstructing notions of eternity, wholeness, and normativity. Thus seen, the work is designed to educe systems of cataloguing, control, and linearity, which are simultaneously set into motion through a dialogical pull, opening up a space aimed at questioning nature, culture, archive as a repository of different systems of knowledge and understanding (2004, p. 64). (10) Interestingly enough, both of these spectres, the body in pieces and eternity deconstructed, will remain in place and viable only for as long as their respective backing companies feel it’s beneficial for them to do so. Whether or not the spectres achieve their stated goal of protection and salvation will have no bearing on the decision to keep them intact or to replace them with new spectres that will offer new readings of their own. With local elections coming up fast, I have a pretty good idea of the new spectres that are likely to be in place next time I go back home, the town I was born and grew up in. Springgay, S. (2004). Body as fragment: Art-making, researching, and teaching as a boundary shift. In R.L. Irwin & A. de Cosson (Eds. ), a/r/tography: Rendering self through arts-based living inquiry (pp. 60-74). Vancouver, BC: Pacific Educational Press. 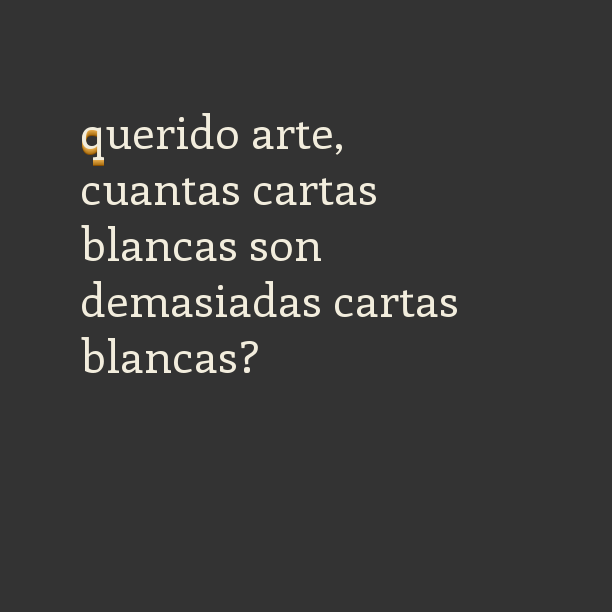 with chiseled skin y ojos de charco. in the desert’s lack of moisture. carving out pathways long before abandoned. demoliendo alcobas arrebatadas entre tornados. crafting interrogatorios donde la saliva capitula. evacuando drifting castles of dirt y remendando arena con expectation.